Silicone is a porous material with different particle sizes, which is dehydrated by silicone. It has an open porous structure and can absorb many substances. It is a good desiccant, adsorbent and catalyst carrier. The adsorption of silicone is mainly physical adsorption, which can be regenerated and reused. In alkaline silicate (such as sodium silicate) solution add acid, acidification, add a certain amount of electrolytes to stir, that is to form silicic acid gel, or in a strong sodium silicate solution, adding acid or ammonium salt can also produce silicone. Silicone was placed for several hours to make it aged, then washed with hot water to remove soluble salts, dried at 60~70 degrees and activated at about 300 degrees Celsius, so that silicone could be obtained. The silicone is soaked in cobalt chloride solution and then dried and activated to obtain discolourant silicone! Silicone pet food can lids, Free samples are available for quality and size check.Please contact our support team to arrange them today! Silicone pet food can lids with three different sizes! 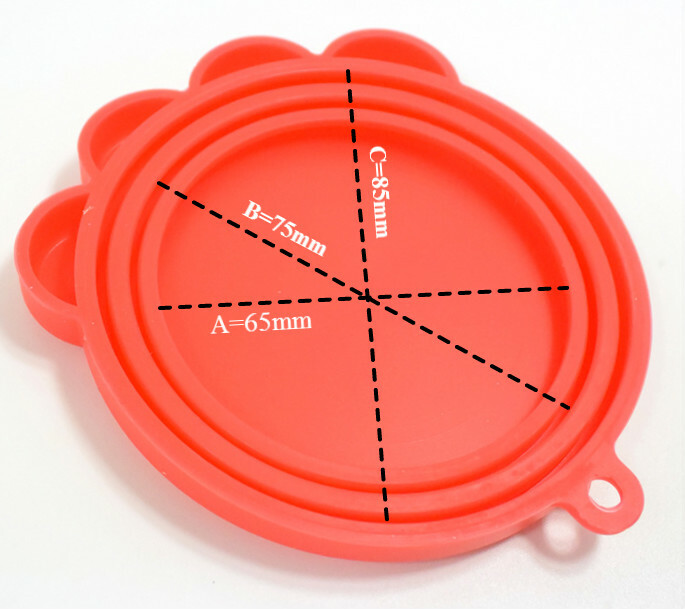 Silicone pet food can lids with 65mm, 75mm, 85mm three sizes to meet all your needs. Silicone pet food can lids: various colors optional, res,blue,green or yellow etc. Silicone pet food can lids with cute design of cat claws! Cover various Pet Food Cans, food cans etc. FREE samples available for quality test about Silicone pet food can lids. Food grade soft silicone material, products are in line with FDA, LMBG, safety certification standards. It is non-toxic and tasteless. The material is soft, elastic, comfortable, distortion, abrasion resistance and long service life. Non-cracking, high-temperature, low-temperature resistance, can work normally in the range of – 50 230, can adapt to a variety of refrigerators, ovens, microwave ovens and other electrical appliances. Good sealing performance and moisture resistance. Unique three layer seal ring to meet most canned sizes in the market. Can be reused, non-staining surface, small size, easy to carry, do not occupy space, easy to use, easy to clean. A variety of colors are available: Red, Blue, Yellow and Green optional.